and indicate the number of copies. and the shipping address for each book. Please email me to check availability and price of second-hand copies. Additional postage required for shipments outside USA. Email me for details. Don't be fooled by "5th" rate imitations of Levine's Guide. The 4th edition was the last legitimate edition. Click HERE to read about and SEE the defects of the "5th" edition. Still puzzled by 4th vs "5th"? Read this comparison review from Knife World magazine. 512 pages, 8-1/2 x 11, softcover, 1997. Please email me to check availability and price of second-hand copies. made -- not just a few brands, as in other knife books. exotics from around the world -- even humble kitchen knives. dealers; and of course ALL THE LATEST KNIFE PRICES. WHAT READERS SAID ABOUT PREVIOUS EDITIONS of LEVINE'S GUIDE. 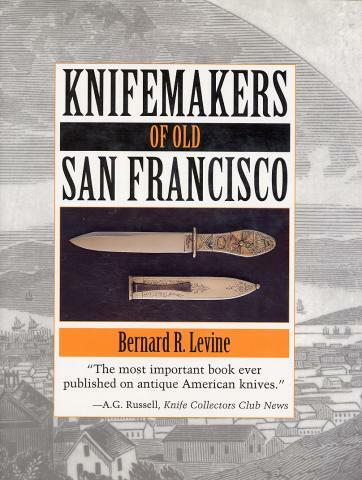 "The best of the collectors' books"
"If I was permitted only one book on knives, this would be it." 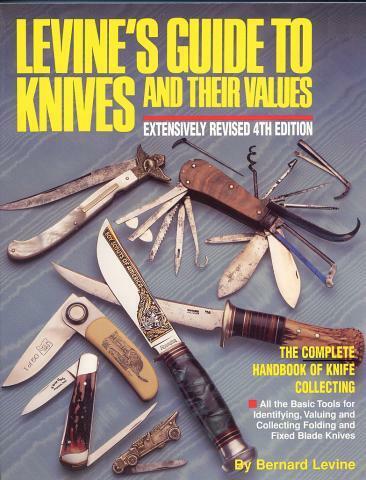 "The most valuable reference tool I've ever had"
"the single best source of general knife information available." "Best knife book on the market! I read through it every day." great gift for those too cheap to buy their own." someone is willing to pay for it, is the gauge of the book." letting me be a small part of it." anyone else in our industry." sobre cuchilleria, y uno do los mayores expertos en la materia. information. What I really want to say is, 'thank you.'" Includes much new information, dozens of new photos. Special Bonus: up-to-date price guide enclosed free. 160 pages 8-1/2 x 11, softcover, 1998. Please email me to check availability and price of second-hand copies. carving set for that dinner. for the evening, you were expected to carry a sidearm. an adjustable dealing box and card trimmer." "The whole thing is beautifully produced."